Celebrate Life Magazine is a publication of American Life League. It covers the entire gamut of topics concerning the right to life of human beings: abortion, adoption, contraception, natural spacing of children, moral and immoral stem cell research, cloning, infertility, euthanasia, care and respect for the elderly and those with special needs, etc. As America’s premier pro-life magazine, Celebrate Life features articles that will encourage, uplift and educate you to build a culture of life. The magazine originated in 1979, when Judie Brown, American Life League’s president, surveyed the cultural landscape and saw firsthand the overwhelming need for a publication that speaks the truth on human dignity and personhood. 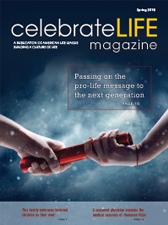 What initially began as ALL About Issues, American Life League’s first publication (originally a green-and-white, four-page newsletter), has evolved into a glossy, full-color, 32-page quarterly magazine named Celebrate Life. Celebrate Life Magazine, delivered right to your mailbox!